My kids loved macaroni and cheese growing up. Not homemade mac & cheese, mind you. The stuff in the little blue boxes. With the fake, orange powdered “cheese”. Ugh. I tell my kids that someday they will appreciate the fact that I did not cook for them out of cans and boxes. The only reason we ever had the boxed mac & cheese is because once they had it at a friend’s house, they were hooked. The same with white bread. Once my oldest daughter had a “taste” of white Wonder bread, she would never eat the whole grain stuff that I bought again. So, I bought the blue boxes of mac & cheese, but I rarely prepared it for them. If they wanted it, then they made it for themselves. It did come in handy as an after school snack when I was working or for dinner when I had a meeting or for a late night meal if they were still hungry after dinnertime (as growing kids can get from time to time). Last December, I went to Sweetie Pie’s at the Mangrove, a soul food restaurant in St. Louis, with some friends from high school and had some of the best mac & cheese I have ever eaten. This restaurant along with the owner, Miss Robbie, were featured on an episode of Diners, Drive-ins, and Dives (here), and it was there that she shared her recipe for mac & cheese. If you Google Sweetie Pie’s Mac & Cheese recipe, you will get about 5,000 hits and all of the recipes are identical, but one post that I read noted that if you watch the Diners, Drive-ins, and Dives video, Miss Robbie adds sour cream to her mac & cheese. So I have taken the recipe posted by many others and added a “dollop” of sour cream and shared it below. 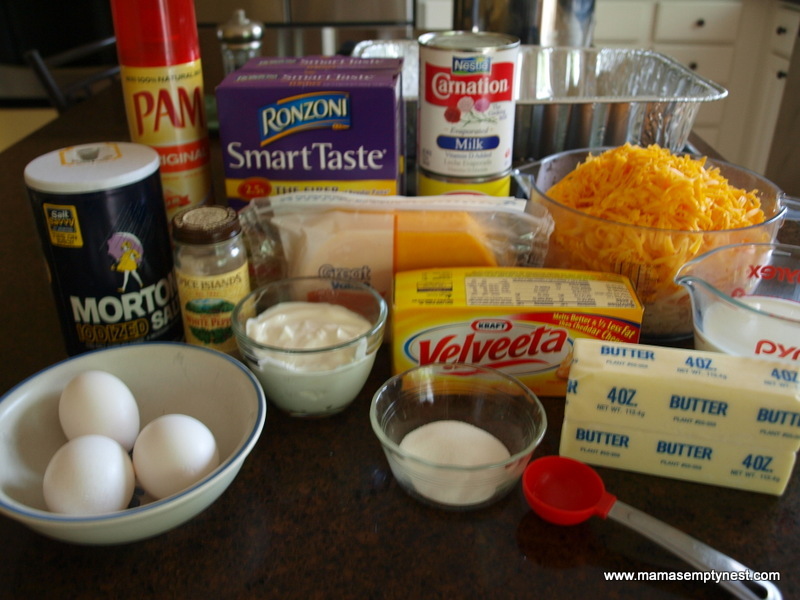 Sweetie Pie’s Macaroni & Cheese ingredients. Preheat the oven to 350° F. Prepare the pan by coating with cooking spray, boil the macaroni until tender, drain, and pour into the pan. Note on the pan: The recipes that I read say simply to use a 9×13 pan. Well, if you use your standard 9×13 pan, it will not be deep enough. I bought a deep sided, disposable aluminum pan, and it was large enough to hold all of the ingredients and to allow enough space to stir them as well. 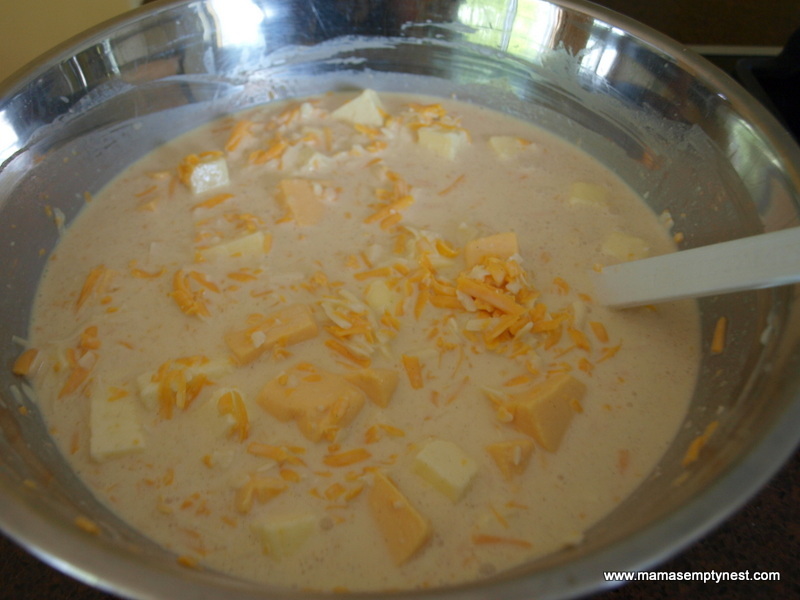 Combine the rest of the ingredients with the exception of the cheese for the topping in a large bowl. Miss Robbie simply pours the liquids, add the chunks of butter and Velveeta, grated cheeses, and seasonings directly onto the macaroni and then stirs it all together in the pan. I chose to mix them in a large bowl and pour this mixture over the macaroni before stirring to combine. After pouring the mixture over the cooked macaroni, stir well to combine and top with the one cup of shredded mild Cheddar cheese. Bake for 30 to 45 minutes or until the top is lightly golden brown. Served with your favorite foods. Final note – This is not an everyday side dish. It is rich, and one batch makes enough to feed a large crowd. The recipes stated “feeds 12” but we had 12 for dinner and only half the pan was eaten so, depending on your main entrée and other side dishes, I think you can easily count on this feeding up to 24 people. Heat oven to 350° F. Prepare a deep sided 9×13 pan by coating with cooking spray. Set aside. Bring a large pot of water to a boil. Add salt, and cook elbow macaroni according to package directions until tender. 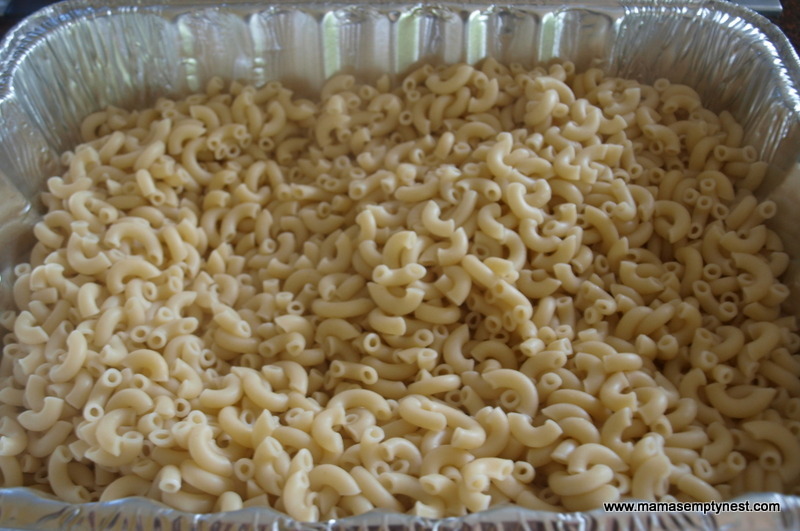 Drain and transfer the macaroni noodles to the baking pan. While the macaroni is cooking, combine the milks and eggs in a large bowl. Whisk until thoroughly combined. Add the butter, cheeses, sour cream, salt, pepper, and sugar and stir to combine. Pour over the macaroni and stir to combine. Top with the grated mild Cheddar cheese. This entry was posted in Food & Home and tagged Casseroles, Pasta Pizza & Noodles. Bookmark the permalink. That is neat! I didn’t know she was on Diners, Drive-ins, and Dives. Know wonder the place is alsways packed. I may have to cut the recipe in half when I make it. The recipe is already half of the size she makes in the restaurant! A really good recipe for a summer BBQ crowd! Question to Mama. I saw this episode. Was amazing and want to make it, but want to bring it to work for a party. We have a microwave, but I can’t put the pan in it. Do you think that after I bake it, I can take it to work in a crock pot and warm it the next day? If not I have Trisha Yearwood’s recipe for crockpot mac and cheese which was great, but i wanted to impress them at work with this recipe. I would make the crockpot version if you don’t have access to an oven and serve it right away. Also, I know a lot of people omit one stick of butter successfully. It is a very rich recipe, but the sour cream adds that bit of tang that really puts it over the top. Maybe add a little to Trisha’s recipe which looks fabulous, too! Do you have the recipe for Ms.Robbies fried chicken? I really want it & I loved it when I visited her restaurant in St.Louis! I don’t! I would try to Google it! We love Sweetie Pie’s. Can I make this the night before and cook next day? There will be a large crowd at my home in June, so this will be a great dish to make. Having left overs will be a bonus! Thanks. This recipe is very rich – I will be interested in seeing if the kids like it. I was surprised by how well it reheated in the microwave. when i made it, it was way too rich. i like my mom’s recipe alot better. hers was so much better at the resturant. Yes it is very rich. I thought it was just as good at home even though her crust was a little crispier on top. My kids also like the Panera Bread Company white mac & cheese. I might have to try and find a knock off of that recipe, too. I checked out all the other recipes and noticed the sour cream was missing. Thank you for correcting and I can’t wait to make it (and freeze in four separate containers). Yes, if you saw Guy Fieri’s episode on Diners, Drive-ins, and Dives, she added sour cream which one of the recipes that I found mentioned. You Tube took that video down, but not before I saw it! Making this recipe tonight along with Crock Pot BBQ Pork Steaks, yum! I just watched the video on YouTube: http://youtu.be/Pbam7LPHRfY and it’s also on the Food Network. Boy, I’m gettin hungry. 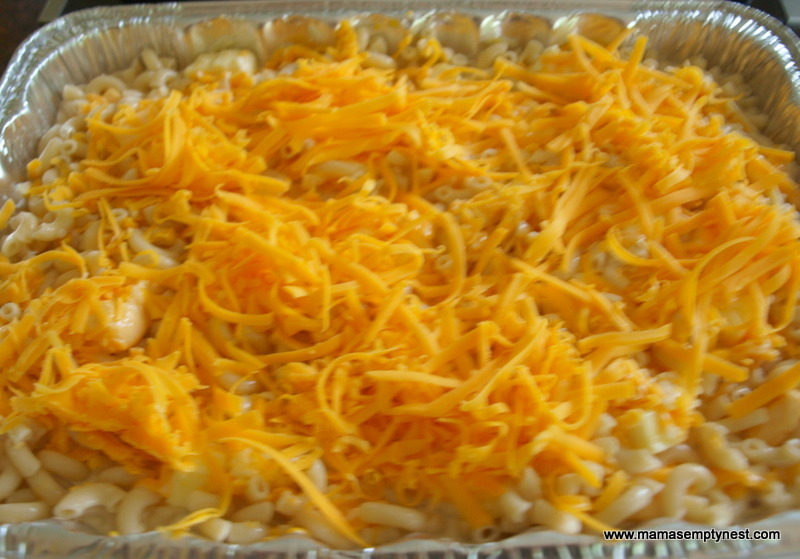 I have several homemade mac and cheese recipes and this is one of the best. The secret ingredient, I think, is the sour cream. Thanks for visiting and hope you enjoy the recipe! Well, I like many that come across my desk. Alton Brown has a boxed knock-off version that my daughter made and liked. It’s an easy one for during the week and a quick meal. I’ll have to make some and share. Have you made the Sweetie Pie’s version? I made a large batch for a party and had about 1/2 a pan leftover. One of my guests loved it so much that I let him take it home, and I heard he ate the whole rest of the pan! Comfort food, shared with family and friends – there is nothing better! Made this tonight especting a terrific mac and cheese and I got a curdled mess. Ouch. Making this mac & cheese is expensive and it’s horrible that it did not turn out. Here is a link to a website about possible reasons – http://www.food52.com/hotline/11714-why-does-my-homemade-mac-and-cheese-curdle-what-am-i-doing-wrong. In recipes like this please make sure to use whole dairy and not skim or low fat. Fats help mixtures to bind together. Also, I never use the pre-grated cheese because it contains corn starch and other things that prevent smooth melting. When I made this recipe, it turned out smooth and creamy. Please try to make homemade mac & cheese again – another recipe that my kids like is Alton Brown’s Stovetop Mac & Cheese (http://www.foodnetwork.com/recipes/alton-brown/stove-top-mac-n-cheese-recipe/index.html). I haven’t made it, but it makes an easy and smaller batch and my kids like it. I made the recipe & it was ok. I’ve also made Alton Brown’s stove top recipe numerous & it is quick, delicious & tastes alot like what my mom use to make with I was young. Mac & Cheese is one of those recipes that people seem to have very different opinions on how it should look and taste which is the case with most comfort foods. I like to try different version with different cheeses and cheese combinations and try to appreciate them all. Hey…I watched the diners and drive in episode and she just poured “some” milk…where is everyone getting the evaporated milk from? Evaporated milk can usually be found in the baking goods aisle. Mama, I think Tasha is referring to the “Diners” video NOT showing either Mama or Guy adding any evaporated milk, yet your recipe calls for it as does Alton’s stovetop recipe. Just sayin! Regardless, I always use it. I agree, she didn’t use evaporated milk. Using evaporated milk would definitely make the dish even richer, but in the video she only adds regular milk…so I’m also wondering why your recipe calls for evaporated milk – was that part missing in the video I just watched??? Thanks for any clarification! Thanks for visiting, reading, and posting. As I said in the post, I used the recipe that many others had posted previously and noted, like one other person, that she also added sour cream in the DDD episode so I added that, too. Since I live in the St. Louis area, I have been to Sweetie Pie’s and the recipe is just like what she serves in the restaurant. Hope you saw my fun post of my visit to the restaurant with some friends from high school. I got a picture with Miss Robbie and we were there on a day they were taping her show for OWN! We had to sign a release in case they used footage from when we were there, but I haven’t seen an episode with us in it yet. She is a really sweet person and was very accommodating to us. One of my friends had made some White Chocolate Party Mix (recipe is also on my site) to share and gave some to them. They were thrilled. My friend later took a batch into her and shared my post. They were so sweet about it! Anyway, hope you enjoy the recipe and my blog! if you look at the video closely she added the evaporated milk into the noodles from a pitcher and then the regular whole milk from a jug…Look again!!! Yes, the recipe included both types of milk. Thanks for sharing this recipe and adapting it to the perfect proportions for the average household or Thanksgiving dinner. The ingredients are almost identical to what I use in my own mac-n-cheese with the exception of the sour cream. I don’t know if I will go with just the cheeses listed in this recipe or use the blend of cheeses I normally use. When I make mac-n-cheese, in addition to 1/2 loaf of Velvetta cheese, I use the “Fiesta” blend cheeses which I purchase in a bag from Walmart. The 32oz bag of Fiesta Blend Cheeses I use is a combination of shredded Monterey Jack, Cheddar, Queso Quesadilla and Asadero Cheese. I top it off with freshly grated mild Cheddar Cheese. I came across a recipe shared on television that used: Velveeta Cheese, Gruyere, Mozzarella, Colby-Monterrey Jack, and Sharp Cheddar. The Gruyere cheese is not a cheese carried in most of the supermarkets I visit. I have not made any special effort to find it but I am very curious about how it will taste, along with the other cheeses, in a mac-n-cheese dish. Mama, I’m glad you added the sour cream to this recipe because the other few copy cat recipes I initially came across this evening were missing that very important ingredient. A 1/2 cup of sour cream seems about the right amount for 12 servings. In regards to the various milks, I always use 2 cans of evaporated milk along with some whole milk in my homemade mac-n-cheese because I prefer the taste. Besides, whose to say Ms. Robbie did not use evaporated milk but had it edited out of the footage to protect her recipe?!?!? A lot of the restaurants will mention that they use secret ingredients OR they will show you all the ingredients they use but not give you the proportions, exact measurements, baking temperature or baking time to protect their recipes. With that being said, I’m sure glad Ms. Robbie let us see her put those heaping spoonfuls of sour cream in there, though! I never would have thought of using sour cream otherwise. I love watching “Sweetie Pie’s” on OWN and I will be looking for your face when i watch upcoming episodes!!!! In the meantime, I would like to wish everyone a very safe and Happy Thanksgiving!!! Thank you so much for visiting and commenting! What I have found with Mac & Cheese recipes is that people have widely varying preferences with regard to which ones they prefer, and I, too, loved the idea of adding sour cream when I saw it in the DDD episode. It adds a nice tang to the final product! Gruyere is an awesome cheese – it melts really well, but it is expensive. I have found it in my local food warehouse and shred and freeze it in 2 cup increments. I rarely use pre-shredded cheeses because there is usually cornstarch or other additives to keep the shreds from sticking, and I find it works better if I shred my own. I hope we end up on an episode of Sweetie Pie’s, but, in the end it doesn’t matter because we had a great time at Miss Robbie’s restaurant, and Miss Robbie was a real sweetheart. Come back and visit my site! I split the recipe in half, used White Vermont Cheddar! It was probably the best Mac & Cheese I have ever ate. Sounds wonderful! Thanks for visiting and commenting. I Googled it and came up with a list of cafeteria recipes here: http://everylastrecipe.com/search.aspx?q=morrison%27s+cafeteria+recipe. I’ve found that many people have very particular tastes with regard to Mac & Cheese. Some like different kinds of cheeses and some like varying degrees of gooey goodness. Hope this helps! You have to keep your eye on the screen when watching the video from DDD. Just before the whole milk Miss Robbie poured in the evaporated milk out of a pitcher. It was going so fast that it is easy to miss it. So your recipe is right on point. Thanks for the feedback! Hope you enjoy the recipe as much as we do – we’re having a ham with mac & cheese as a side dish for Christmas Day dinner. I saw the video also and she also used 5 eggs. I know that a lot of people are complaining about the recipe, but the video is still being shown and I just watched it again. Write down what she is , saying and don’t watch the video. There are a lot of ingredients and she doesn’t mention how much she used with each one. We made this for Christmas, and it was great! I’m looking forward to trying it with different cheeses like white Vermont. I made a half pan for this and it was great. However, it was really buttery. I used 1 stick. I’m going to make this for a party and make the whole recipe. Did anyone else have problems with the butter? I’m trying to decide if I should just use 1 stick or go by the recipe of 4 sticks. I just kinda eyeballed the elbows for the half pan I made and used 1 stick. I might not have made enough pasta for it. Any suggestions? The entire batch turns out really buttery, too. I stir mine partway through cooking and then let it brown on top. The recipe calls for 1 cup butter. That is 2 sticks, isn’t it? Yes, each stick of butter is 8 tablespoons and 1/2 a cup. Many people make this recipe using only one stick of butter successfully. Just remember to use whole milk products versus no or low fat versions since the dish needs the fats to bind everything together! Do you think it would still taste good just using one stick? Remember it is the fats that help to bind the ingredients together. I think so long as you are using evaporated milk, whole milk, and regular sour cream, it should be okay to eliminate some butter. I’ve heard from several other people who have substituted other cheeses (like white Vermont cheddar) and that would be fun to try, too. I made a whole batch for a party and had part of a pan leftover (I use the disposable pans for parties). I gave the leftovers to one of the people who LOVED it, and apparently he ate the rest of the pan on the way home in the car. I think it would be safe to grate the cheese and combine those ingredients, but I would wait to cook the pasta and combine until ready to put into the oven. One thing that I usually do is to stir it about halfway through cooking, but then let the top get crispy. Super rich and yummy! I WAS WONDERING. CAN YOU USE REGULAR BUTTER INSTEAD OF THE STICK BUTTER? Well, the stick butter I use is regular butter, but you can use 1/2 cup of any kind of butter you buy! That’s great! Thanks for sharing this tip on the butter and have a Happy Father’s Day with the men in your life! I made this mac n cheese for my daughters birthday party . I omit the pepper and salt. Everyone loved it, this mac and cheese was so good ,Thanks! Thanks for visiting and commenting! Glad you enjoy my little blog! This looks amazing Mama! I am making this for my boyfriend’s birthday party next month, do you think I could use regular pepper instead of white or is it essential? I read some reviews on another copy kat recipe for Sweetie Pie’s Mac and Cheese and a lot of people said the white pepper tastes strange, I have never tried it so I have no idea. Also, for the deep dish foil pan, what were the dimensions? I want to make sure I buy one big enough. Thanks so much! Many people (including Bobby Flay) dislike white pepper and use black instead (unless you’re Anne Burrell who doesn’t like using pepper at all). I know that some people only use one stick of butter successfully, but make sure you use whole milk because you need the fats to bind it together. I made a batch for a family get together and one of the guests loved it so much I gave him the rest of the pan to take home. I heard that he finished it off in the car! I used the large, extra deep lasagna foil pan and put it onto a sheet pan to put it into the oven to make it easier to handle. I am making this dish for the football team. Can I make it a day ahead of time? Mac and cheese is one of those dishes best served as soon as it is cooked / baked. The mac and cheese I like is Paula Deens – from her “The Lady and Sons” cookbook. It has eggs, and sour cream, and I’m sure you could substitute other cheeses, if you wanted more than the cheddar taste. I like the custard-ee taste of the eggs combined with the cheese. This sounds good too, but sooooo much . . . I like that one, too. You’re right – Sweetie Pie’s recipe makes a huge batch which is perfect for a large gathering. Alton Brown has a good one, too. I really like trying different versions, but many people like a specific taste for their homemade mac & cheese. I made this recipe way back in the spring for our Easter dinner. By mistake I put in 1cup of sour cream instead of 1/2 cup. Made the mac n cheese very creamy which many people liked. I did too, I was raised on creamy mac n cheese so that might be why. What a great tip! I love the way the sour cream adds a tanginess to it, too! Thanks for posting this tutorial! I’m going to make this for Thanksgiving. 1. I’ve never used sugar in my macaroni and cheese, do you know how this affects the mac n cheese? 2. Did you use pre -shredded cheeses? Or did you shred them all on your own ? I just followed the recipe. I know many others who have used less butter or different cheeses with success, but remember to use whole milk products as it is the fats that bind the mixture together. As far as shredding cheese – I shred all of mine. The pre-shredded stuff includes other ingredients that, in my opinion, affect the taste and could alter the recipe. Thanks for visiting and have a Happy Thanksgiving! Ok great! Thanks and Happy Thanksgiving to you too! I would never make mac and cheese in the crockpot. I would use a recipe designed to be made in the crockpot. There are several out there. Thank you for sharing that information! I worry about pasta in the crockpot being soggy so really appreciate you sharing your experience! Do you think it would alter the taste at all if you add a little ground mustard powder? 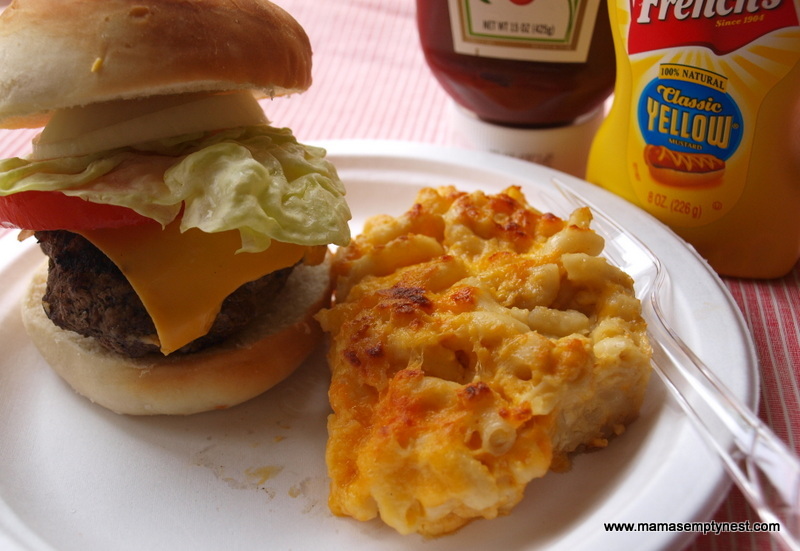 I’ve always added a little mustard to my Mac n Cheese (which my husband really loves) and want to try this recipe but dont know how the ground mustard will affect it.. I think it would be fine to add the mustard! I’ve done this in other mac and cheese recipes, too. Glad you enjoyed Sweetie Pie’s and the recipe! I was at the restaurant one time when they were actually filming their show for OWN. 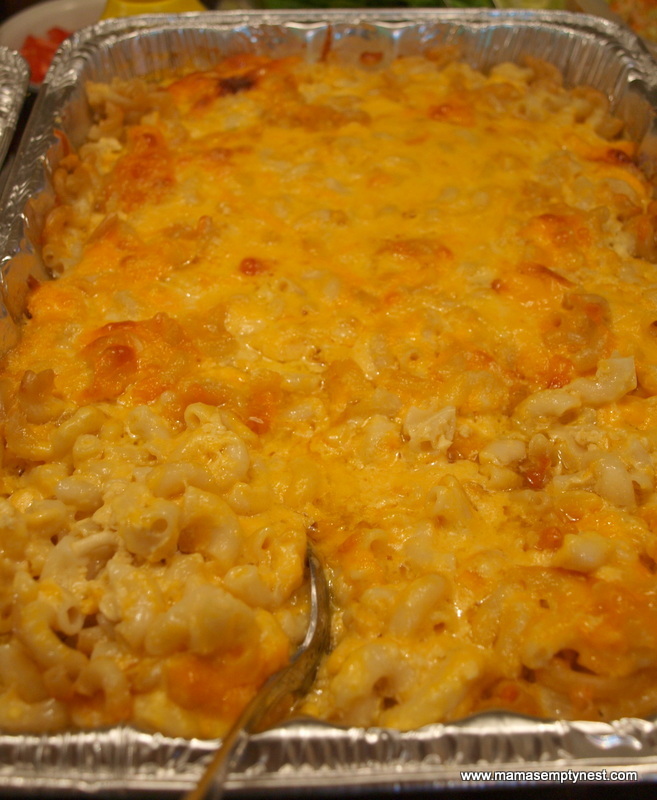 Only 1 pound of macaroni will feed 12-24 people in this recipe ? Final note – This is not an everyday side dish. It is rich, and one batch makes enough to feed a large crowd. The recipes stated “feeds 12″ but we had 12 for dinner and only half the pan was eaten so, depending on your main entrée and other side dishes, I think you can easily count on this feeding up to 24 people. If you read how many servings a one pound box of pasta serves, most say “serves 8”. This dish is so full of other, rich ingredients that it will easily serve more than 8 and, again, depending on how many other side dishes you have, it will serve more. Try it and let me know what you think! Thanks for visiting and commenting. Why is it when I make this dish it comes out sitting in a pool of greasy butter? Am I the only one this happens to? Am I doing something wrong? Am I not mixing it enough or not leaving it in the oven long enough? How do I keep this from happening? It tastes great, but I would love to alleviate that happening. Any help or suggestions? Thanks! Are you using whole milk? You need the fat to help bind the ingredients together. Also, someone else posted that they use less butter successfully. When I make it, I sometimes give it a stir partway through baking, but let it bake long enough to get that nice crusty top and edges (which are my favorite parts). Another thought – are you using a large enough pan? I think you need the surface area to make properly. No matter what, it is very rich! Thank you! I am using whole milk, but I think I will try using a larger pan, stirring it part way through and leaving it longer for that crusty top and edges. Thank you for the advise!! No, I can’t say that you “taste” the sugar. It’s used like a spice in this recipe. What happen to making a cheese sauce by melting the cheeses together with the milk then pouring over noodles then bake.was this step left out? That is a basic technique, but this recipe was written to show Miss Robbie’s technique which is different. There are a million different recipes and different cheeses and ways to make mac and cheese and there is no one right way. Make the recipe that you and your family like the most! Can you make this whole thing and then separate it into two containers and freeze it? How long can you freeze the recipe for since I have a small family. I don’t think I would even try to freeze cooked pasta and cheese. You can certainly make half a batch, but that’s still a large amount. If you’re looking for a good recipe for a small family try Alton Brown’s Stove Top Mac-n-Cheese (http://www.foodnetwork.com/recipes/alton-brown/stove-top-mac-n-cheese-recipe.html). I need to double this recipe for a large crowd (40). Do I need to use that many eggs? 8 eggs seems like a lot. I would double the recipe and use two pans. The original recipe says 3 eggs so that would be 6 if you doubled it. Depending on how many sides and other food you have, you might only need one batch. I have tried many versions of homemade mac and cheese and am always looking for that winning one. How would I alter the measurements to make half of what is called for? I want to test this before Thanksgiving but know that we probably wouldn’t eat all of it right now (less people). This post includes many comments which people may find helpful including making a full batch but using two pans and saving one for later and halving the recipe (maybe use only one large egg). Many people omit some of the butter so it is less rich. Using whole milk and freshly grating your cheese does make a difference, too. My family requests I make this recipe at least twice every year. I totally agree that using freshly grated cheese makes a big difference instead of the pre-packaged cheese. Thanks ‘Mama’ for posting mrs robbies recipe, I’m so glad I found the first mac n cheese my family loves. I’m so glad you enjoy Miss Robbie’s recipe! If you are ever in St. Louis you must visit her restaurant and enjoy her authentic Southern dishes. Thanks for trying this recipe which is very, very rich. If you read the comments, many people omit some butter and the recipe still tastes good. If you are looking for another version, many people use Alton Brown’s Stovetop Mac and Cheese. I believe it is one of the most popular recipes on the FN site. Never heard of white pepper! Can I use black pepper instead? White pepper is not as harsh as black pepper and is readily available in the spice section of any supermarket. If you use black pepper, I would start with less and taste as you go. I use white pepper in mashed potatoes and in lighter colored soups, too. For everyone looking for a smaller version of this recipe, check out Miss Robbie’s Macaroni and cheese recipe from a May 2014 episode of Queen Latifah. I made this for our family Thanksgiving yesterday. It was delicious but made way too much, even for the 15 people we served. I ended up freezing a portion as it is expensive to make and I didn’t want to throw it out.. Hopefully, once it thaws and is then reheated in the oven, it will be as good the second time around. The only recipe modification I would make it using half of the butter which is called for in the recipe. Even though I grated all my own cheeses, there was a lot of oil on the top of the dish that I soaked up with paper towels prior to serving. My husband and I have been to Sweetie Pie’s restaurant and had the mac and cheese and he said this recipe was spot on in how he remembers that tasting. It does make a lot and I even changed the number of servings! Many people use less butter successfully, and I’m glad you liked it! Those particular boxes were not full pound boxes so I needed one box plus some from a second box. That looks like more than a lb of macaroni. I used a little more than a lb and while it was delicious…it was definitely cheese and a little macaroni. Next time I will bump up the mac…but it WAS delicious! Thanks for the recipe. Again, two boxes are shown because the brand was not a one pound box. That’s what I love about cooking and baking – taking a good recipe and changing and adapting it for your own personal taste! I will definitely be making this again!! Thanks for sharing, Theresa!! I just made this and it’s so tasty…I used 2 sticks of butter and will only us one from this point on. I’m waiting for my son to come home from work and see how he likes it. Thx Mama!!! Glad you enjoyed it! A lot of people have success with just one stick of butter. I may go that route, too! I love this recipe and I used your method. I did change a couple of things, I used a little more sour cream,half &half instead of whole milk and I did not I repeat did not use velveeta. I used Colby jack, italian blend and sharp cheddar. This recipe is so rich and delicious and will be the recipe I will use from now on. I also do not measure the cheese I just add until it looks right. I agree with you on the velveeta . I tried this recipe for Thanksgiving, everything taste great except the velveeta cheese. It did not melt the way I wanted it to & I cooked the mac n cheese long enough. I will not be adding this ingredient next time. She is great! Thank you for visiting and commenting! I LOVE YOU ALL Show Everything from Scratch. Great Show. Great question! Bake uncovered. If you read the comments, you will find lots of great suggestions including using less butter. Thanks for visiting and commenting. I think that’s a great substitute. I think the key is adding a bit of tang to the recipe. Well, Miss Robbie makes pans of these for her restaurant – the same size pans shown in the picture and that fit into the steam table trays. I would make individual pans rather than trying to increase the size into a larger pan, but I have never cooked in a commercial kitchen. I think you would still want the crust on top and the creaminess inside and you might not get that in a roaster. As far as number of trays, it would depend on how much other food you are serving. One pan as a side dish will go a lot farther than if it’s a main dish. Maybe try one pan first and see what you think about the recipe and how much you will need to make for your needs. Let me know what you decide and how it goes. Has anyone tried to make this with Gluten free pasta? I make a lot of GF recipes, but haven’t found a GF pasta that I like yet. My sister and niece have Celiac. Can I skip the velvetta cheese and add more sharp cheddar cheese? There are many versions of mac and cheese using different cheeses. I think this recipe depends on the Velveeta, but I would try it by making a smaller batch. If you look at the comments you will see how others have experimented with this recipe (reducing the amount of butter, using white cheddar, etc.). One of the keys to good mac and cheese is keeping the fat in the recipe which helps to keep the sauce creamy and smooth. Very disappointed. Very wet and greasy. I think to much liquids and butter. I was so looking for something promising. I’m sorry you were disappointed. Many people do find this recipe to be very wet. I hope you used whole milk because the fats help to bind everything together, and several people used less butter successfully. The mac and cheese at Sweetie Pie’s is spectacular! i would use 3/4 cup of butter! Could this recipe be used in a smoker? I don’t know if Sweetie Pie’s recipe would work in a smoker. I have a Big Green Egg and my go-to website for recipes, other than the BGE one, is Smoking-Meat.com. Here is his recipe for smoked mac and cheese: http://www.smoking-meat.com/august-15-2013-smoked-mac-and-cheese-with-bacon-and-pulled-pork. This recipe was soooo good! I put it in my Masterbilt Electric Smoker for 2 hours while I was smoking chicken leg quaters. My fanily loved it. Thanks for the recipe. That is good to know. I’m thinking about firing up the smoker this weekend and may give this a try! I saw this on triple “D”! and wrote the recipe down! I did made it and was so good! I love Mac and Cheese and grew up on my Grandmas! Great comfort food! If your not counting calories! 😉 Thanks sharing! I only use unsalted butter. If a recipe calls for salt, I can adjust to taste. There is about 1/4 tsp of salt per stick of salted butter. Read the comments to see adjustments made by others! Sure! Just taste before over seasoning! I made the macaroni and cheese for thanksgiving, but it tasted a little bland to me maybe because I forgot the velveeta cheese it just tastes like bland macaroni and I made sure it has salt . So you know what could of went wrong? I also used 1 stick of butter in the dish but you could still see all the oil and butter coming out of the top of the macaroni. I think the recipe used at Sweetie Pie’s restaurant contains a lot of butter because the pans sit on the warming trays for awhile. Adjusting the butter is a great way to enjoy this recipe at home! I am nervous to use this recipe because I’ve never used eggs in my mac n cheese. I’m definitely going to give it a try though because it looks amazing and the comments we’re positive. Being that I have small eggs in my fridge (because they came from the chickens in my backyard), should I add an extra egg? Assuming about 2 ounces per large egg, measure about 2/3rds cup of egg or thereabouts. I followed this recipe for my moms birthday dinner. Needless to say me nor my mother was able to taste it!! Everyone enjoyed it. I took your advice and stired half way through. ya I should have stirred half way through too! Made this for my Thanksgiving 2015! It was my first time making mac and cheese from scratch…turned out great! thank you for the easy recipe and delicious recommendation! I made this for a hospital potluck (hubby works there). They “loved” it and ate the whole pan. Funny thing is that they actually ate at 11 am and I didn’t get it to them until noon. No problem, they ate it and some went back for seconds. I made the recipe following your instructions and it turned out wonderful. Oops, I did make it with 1 1/2 lbs of macaroni and it was still perfect. Great dish for a large potluck! Do you have the crockpot version of this recipe? No I do not but there are some out there if you Google it! What if I wanna use a pound and a half of noddles?do oiadd any more stuff to it? Another poster used this amount of noodles successfully. I would reduce proportionately. I’m glad it turned out! Maybe your oven temperature is off? Eggs add richness and help to thicken the sauce (think custard). You might experiment by reducing the other liquids. I’m making this for a little over 40 people. Should I do two pans? One pan may be enough depending on how much food you have. It’s rich! I think you could prepare it to bake the night before, but wait to bake it the before serving.